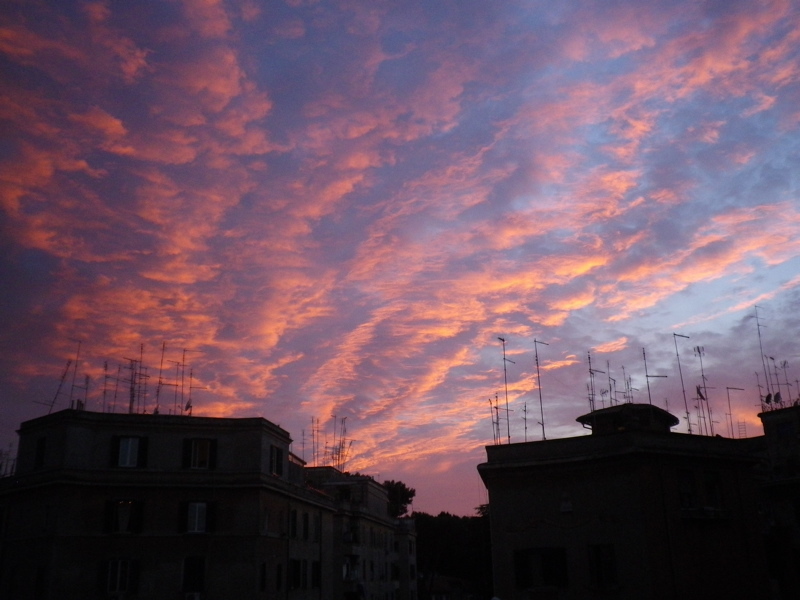 This was baked last night, when Rome suddenly cooled down a bit. It is so nice when there’s a fresh evening breeze. I set the dough Friday night, left in the fridge until Saturday afternoon, and baked the bread in the early evening, when we could open the windows and get a cross-breeze. Otherwise the kitchen gets unbearably hot! Mix all, all, let rise an hour, fold. Cover and leave in fridge up to 20 hours. It will keep rising, slowly. Take out and let come to room temperature (might take an hour or two, depending on your kitchen temperature). Fold dough a few times. After folding a final time, move dough to a floured banneton to rise for an hour or two. It’s a relatively firm dough, and it could be baked free-form as well. Heat your oven to 250C, and place a cast iron pot with lid in the oven to heat up, for at least 20 minutes. It needs to be really hot. When ready to bake, carefully take the pot out of the oven. Invert the banneton onto a small sheet of baking paper, and quickly lift the dough into the pot by holding the corners of the baking paper into the hot pot. Slash the top with a knife or kitchen scissors. Bake at 250C for 30 minutes with lid, then 10-15 minutes at 230C without lid. The bread should sound hollow when you knock on the base. Cool before slicing. Note: this was a drier dough, but I baked it it in a cast-iron pot to keep moisture in, to encourage the rise. I still think the results are better with a higher hydration dough than this, but was curious to play with the flour/starter ratios. Use more water if you wish. 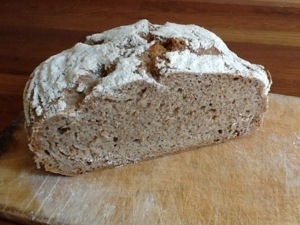 Not much in the way of air pockets this time, but very good flavour, probably because of the slow fermentation. Nice firm structure for sandwiches. Oh, and there is another public transport strike in Rome again tomorrow. Good to know there is bread waiting for breakfast, before dashing out to catch a bus before the strike starts at 830! 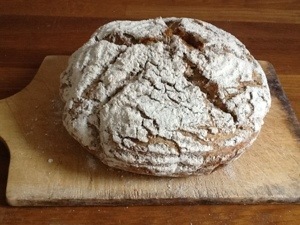 This entry was posted in baking, food and tagged bread, sourdough on June 23, 2013 by krumkaker. • The award is given by bloggers to bloggers with fewer than 200 followers. • Each blogger should answer the questions the tagger has set you. • Choose eleven new bloggers to pass the award to, and link them in your post. • Create eleven new questions for the chosen bloggers. • Go back to their page and tell them about the award. • Each blogger should post eleven random facts about themselves. What’s the craziest combination of food you have ever attempted to blend together? Curry on sweet rice porridge, but that was an accident….. not recommended. If you could change one thing about your life right now, what would it be? Magically have the mortgage paid off. What’s one life lesson you’ve learned/experience that you think is worth passing along? Baking bread is easier than you think. These are the bloggers I nominate, in appreciation for their writing, and would happily recommend that you explore. I know not all bloggers like awards, so if that’s you: please do not feel obliged in any way to do anything about being nominated – just enjoy the thought. Do you have a new recipe you are planning to try this week? If you could spend a week anywhere in Italy on holidays, where would you go? What is your most-used cookbook or recipe source? What are you especially looking forward to this summer? One essential piece of kitchen equipment? Best movie you have seen this year? What should I do do with the two avocados in my fridge? Making tea for the British in-laws intimidates me. I excel at ignoring anything sports-related. Currently reading “The Devil’s Larder”, by Jim Crace. I have three siblings and we all live in different countries. “The Great British Bake Off” is my favourite TV show EVER. I’m making salad with watermelon, feta and garam masala for dinner: Recipe here. I speak several languages, badly. Quinoa appreciation is something I am working on; not there yet. My cookbook collection is taking over the bookshelves. Finding random facts is harder than I thought. I’m rather excited about going to Puglia next weekend. All the best to the Liebster Award nominees! Update November 2013: My goodness, another Liebster Award! How nice! This time from the lovely mrs choux. Many thanks again. This entry was posted in writing and tagged awards on June 23, 2013 by krumkaker. Lovely summer evening last night. 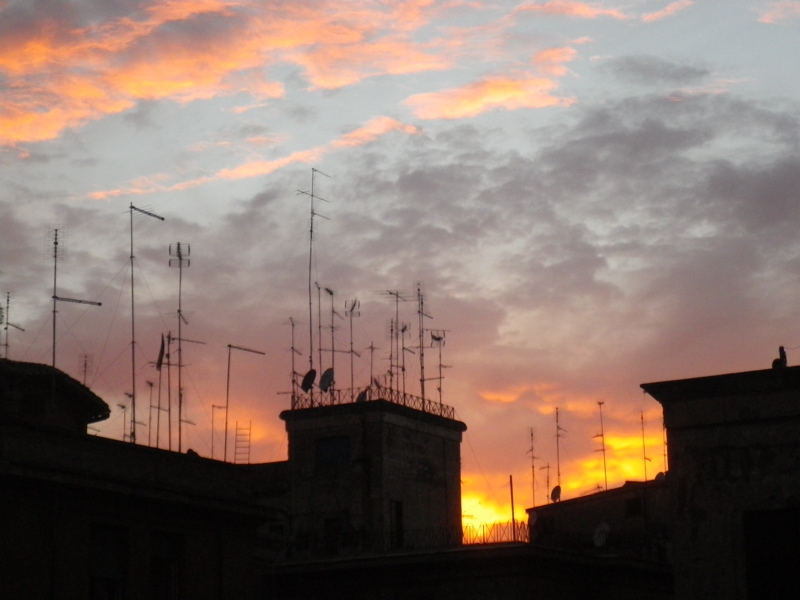 There was a cool breeze, and the most gorgeous light over Garbatella. 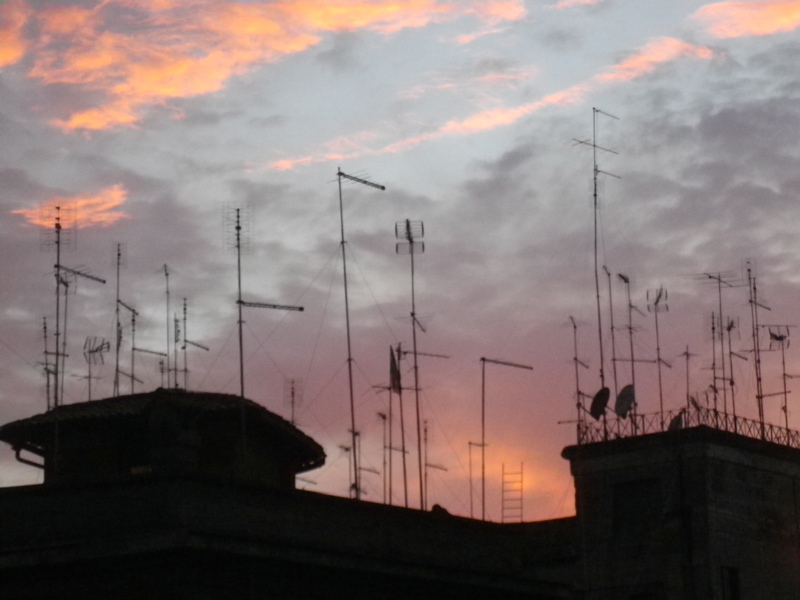 Those are TV antennas. There are forests of them on the rooftops, often with cables danging down to the respective flats. Looking at the changing light, the sounds were carrying across piazza on the evening breeze, as windows had been flung open all over to let the cooler air in. Wonderful, after the hot week here. Someone having dinner, someone laughing, and hammering from the bar opposite where they are doing very slow repairs of some sort in the evenings. And there were chairs scraping up on the roof terrace across the road, as a group there gathered to watch football, Brazil-Italy. It was very quiet as the game went on, so Brazil must have won. Then someone played really loud disco music for an hour or two, possibly a birthday party in the next road. Or maybe kids celebrating school finishing, who knows? (No, come to think of it, they would probably listen to something more modern than disco I recognize…) Still, it was a really nice evening. 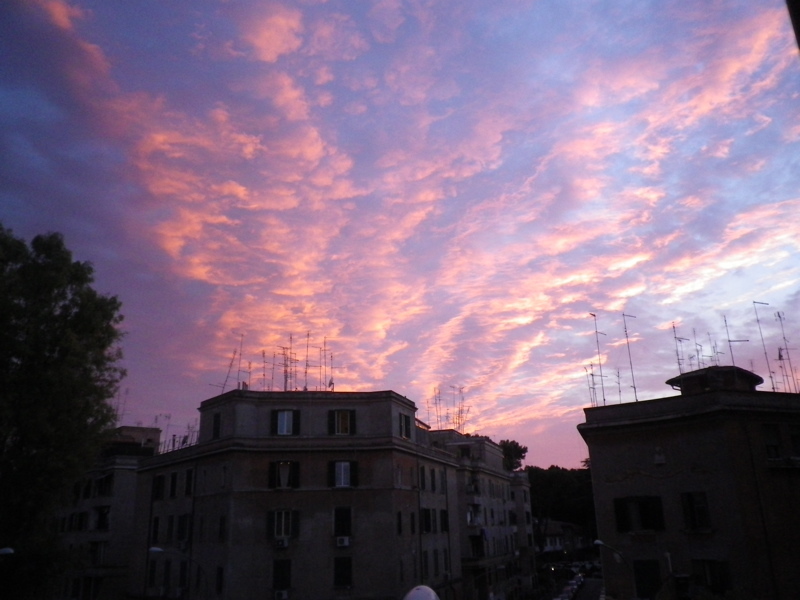 This entry was posted in Rome and tagged Garbatella, sunset on June 23, 2013 by krumkaker.